In all honesty, I’ve been struggling to commit to a regular exercise regime and I’ve certainly been feeling the effects. Tight muscles, a sore back, lethargic, lacking confidence – basically just feeling a bit rubbish. So last month I decided enough was enough. I needed to give myself a good kick up the bum and start exercising regularly three times a week. This is my magic number but yours may be different. You’ve got to be realistic and make sure your weekly goal fits in with your lifestyle. If you can only commit to once a week, that’s absolutely fine – it’s about sticking to it. I’ve also realised that I don’t need to spend hours at a time exercising. For me, I’m much more likely to go if I know it isn’t for too long! I can deal with an hour’s class – just about – but no longer. And in the gym, it’s more like 20 minutes as cardio is not my strong point. But 20 minutes on the treadmill is better than nothing, right? And the thought of it doesn’t psyche me out, like an hour in the gym would. I have to make it manageable mentally to be able to stick to it. I’ve been exercising three times a week for the past month. And I’m happy to report that I’ve kind of found my groove. I do a regular Yoga class, a regular Pilates class, and either a 20-minute swim or treadmill session at the gym. Obviously there are days when I’m just not feeling it and it’s a struggle to get to class but overall, I feel so much better for it. Three things have really helped me to commit to a regular exercise regime. I’m sharing them here because if you’re struggling to make exercise a priority, maybe they can help you too. At first, the thought of committing to a weekly class made me feel a bit anxious – what can I say, I’m a bit of a commitment phobe! But I’m actually really pleased that I’ve done it. Having a regular class in my diary has really helped me to show up. I like seeing the same friendly faces and the feeling of comradery and support you get from the other class members. Plus you can have a bit of a laugh together! If my exercise class is in my diary week after week, I can make sure I plan around it so that I can go. I can’t make excuses because it’s the same every week. If I just said to myself, oh I’ll go at some point this week, it probably wouldn’t happen. So a regular weekly class works really well for me. Working out doesn’t have to mean going to a gym – I totally get that they’re not everyone’s cup of tea. While I am a member of a gym, and I do enjoy it, I can understand why some people – especially those who are new to exercise, or older maybe – feel intimidated by the gym. For me to commit to going to a class, I need to know that the teacher knows what they’re doing. I need to see that they love what they do. That they’ve got a real passion for it. If I see them as a role model, it makes me want to learn from them. I attend a weekly class at The Pilates Pod in Hitchin. Look at all the amazing Classical Pilates apparatus! After class last week, one of the ladies told me that it took her a whole year to pluck up the courage to even just go in to the studio to ask about classes. A whole year! That’s how hard it is for some people to just start. 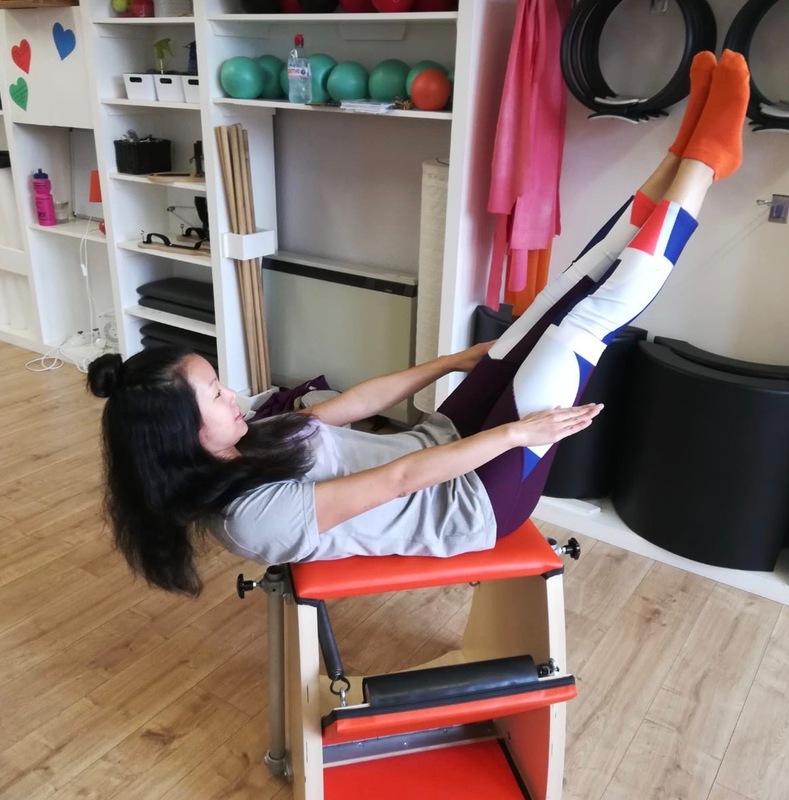 She has now done her seventh class and she said that she already feels stronger – especially in her upper arms which were very weak before. And that’s only week seven! She told me how comfortable she feels in the studio, and how good the teachers are. And she said that she just loves how she feels afterwards – she leaves the studio walking taller. …focusing on how amazing I feel afterwards! This is really why I want to move more. I get such a boost of endorphins after exercise. It’s as much about my mind as my body. You also get that nice little burn in your muscles the following day so you know they’ve had a good workout. Knowing I am investing in myself, and in my health, makes me feel GOOD. It helps to make me feel stronger, and more confident in tackling the challenges of every day life. And as you well know, mum life can be damn hard! If I’m feeling particularly stressed or anxious, I usually head to the pool as I find the water really calming and it really helps to clear my mind. Exercise for me is like therapy. It’s so easy to get caught up in the day to day and make excuses why I shouldn’t go, but I know that I NEED to do it to stay healthy and sane. I exercise so that I can live better and feel happier. So those are the things that are helping me to stick to a regular exercise regime. I’m only a month in so I’ve got a long way to go but I’m feeling positive so far. What about you? What helps you to exercise regularly? Please share in the comments so that we can support each other!